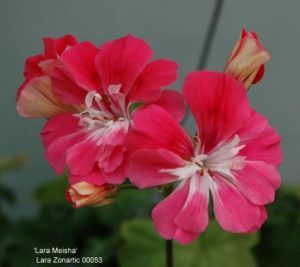 The Lara zonartic hybrids that are shown here are some of the results during 22 years of breeding with hybrid plants that were initially raised from crosses of a zonal or a zonal/ivy cultivar as the seed parent and the species Pelargonium articulatum as the pollen parent. 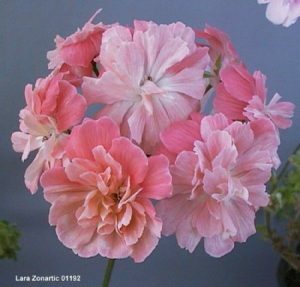 There have been many interesting flower forms and colours produced from this line of breeding. 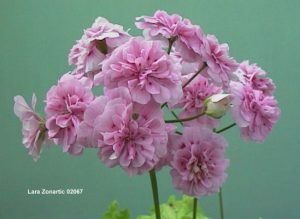 This is possibly the first occasion that this species has been used for hybridizing with zonal varieties or other species. 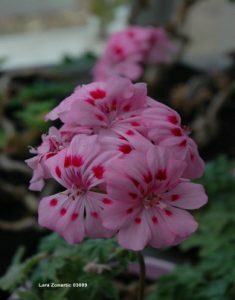 Pelargonium articulatum is indigenous to Southern Africa. 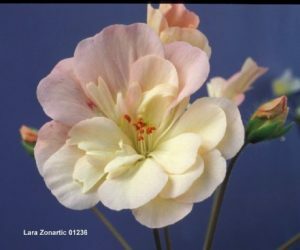 This pelargonium species is “characterized by an underground rhizome consisting of alternating thick and thin portions”. 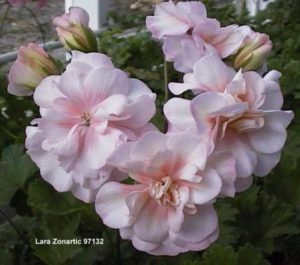 Generally there is little stem growth above soil level. 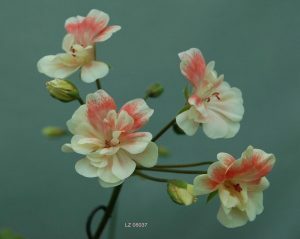 It has a deciduous nature – with early leaf senescence, which is very unappealing at the time the flowers are blooming. 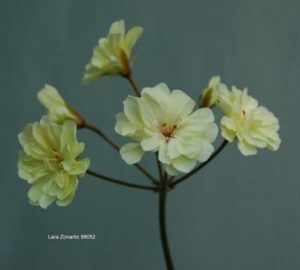 The pale yellow flowers are attractive; the few flower stems produce only 2 to 5 florets each and the flowering season is rather brief. 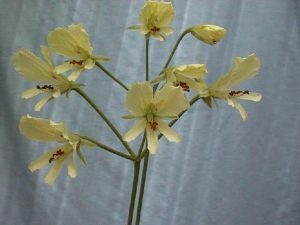 These yellow flowers are the main attraction for breeding with this species, although the short nodal distance and the mild leaf scent are possibly useful characters. The deciduous nature is of doubtful benefit. 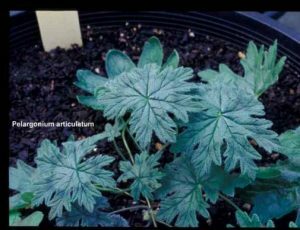 There are other characters that are not suitable for breeding purposes such as the long thin petioles that tend to let the leaf blades droop. This is the growth behaviour when container grown in captivity far away from its natural habitat. 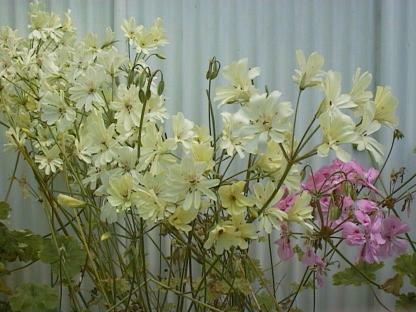 These are another 3 of the 1986 original hybrid seedlings. They were partly deciduous; their form and habit is about midway between the parents. 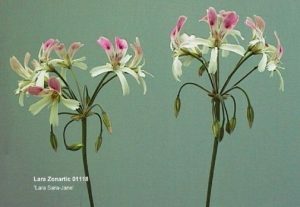 They have a non-symmetrical form and very irregular branching. 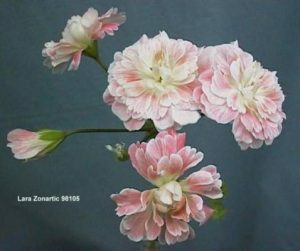 The fact that articulatum did combine with a zonal type cultivar to produce a new hybrid breed was itself an exciting development. 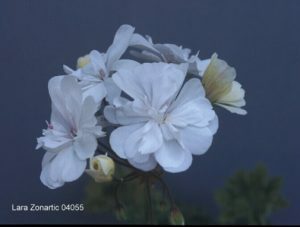 The flower of 94171 has about the same colour as the flower of species P. articulatum lineage chart. 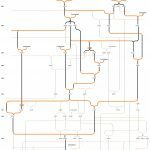 This is part of the Zonartic Family Tree, showing the line of descent to seedling 94171 – the first semi-double, yellow zonartic. 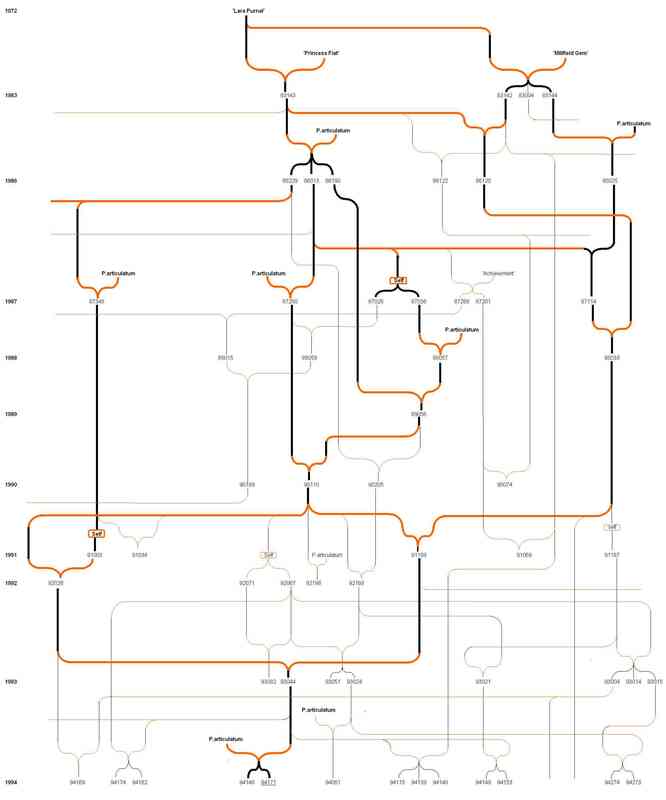 Three of the originating parents are at the top of the Lineage Tree. 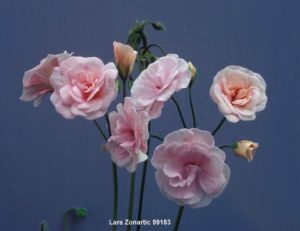 ‘Lara Purnal’ – ‘Princess Fiat’ and ‘Millfield Gem’. 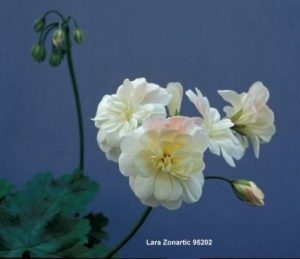 Then two seedlings from combinations of these parents: ‘Lara Classic’ and ‘Lara Polka’ were crossed with P. articulatum the pollen parent in November 1985. ‘Lara Signal’ was used later. 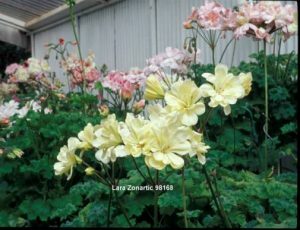 These are the original ingredients of the Zonartic hybrids. 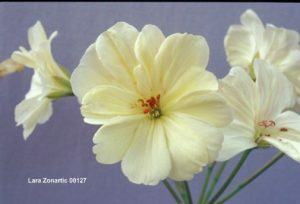 If you follow the line of descent to 94171 you will notice that articulatum is introduced into the line 6 times during that period, also when it was used as a seed parent or pollen parent. 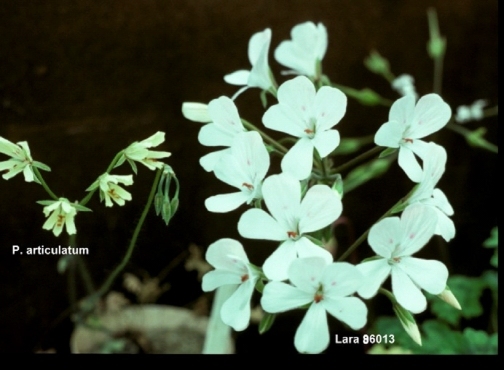 The seed parent is always shown on the left side of the combination. 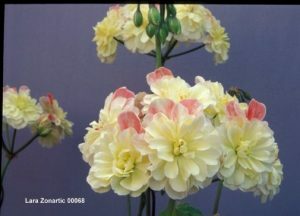 At this point in 1994 it was briefly thought the development of a yellow flowered commercial cultivar was possibly just around the corner, but then; because of the form and habit of these hybrids which do include some unwanted characters inherited from species articulatum – it was soon realized this could be many years away. 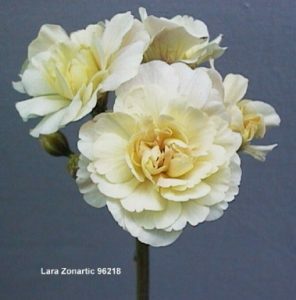 However the arrival of the semi-double yellow flower with 9 to 11 petals was a big improvement on the appearance of the yellow flowers and was definitely an encouragement to continue on the journey. 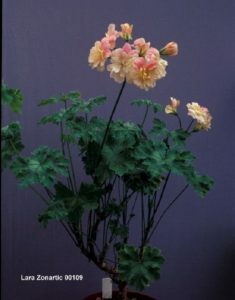 Selection of the parent plants is one of the most important requirements in the desire for getting improvements or decreasing any of the unwanted habit. 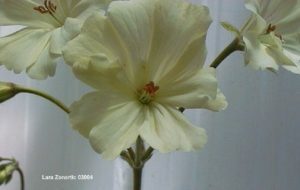 Of course when there are multiple changes required, as is the case with the hybrids of articulatum – a change does sometimes go one step forward with the flower colour but one step back with the petiole length or early leaf senescence or plant structure or the size and number of florets. 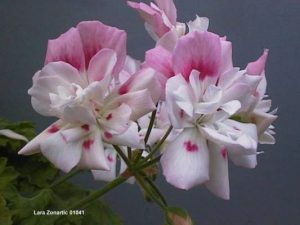 There are so many characters that can be affected by the large gene pool that have been inherited by these hybrids, any of which can influence the resulting seedlings in this ongoing development process – possibly some of these characters are linked, making it more difficult to separate the wanted features that go into the make up of a new range of cultivars. 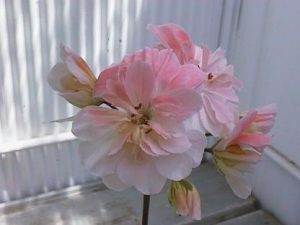 There are a series of interesting times and exciting moments in the basic process of producing hybrid seedlings. The first in this cycle of events would be whilst making the cross pollination of the chosen parents. 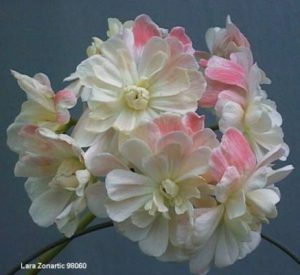 Usually within 24 to 48 hours the first indication of a successful fertilization is seeing the petals fall, the five arms of the stigma sometimes close together and the sepals close around the style, then usually after 4 or 5 days the ovarian beak commences to elongate. About 4 to 5 weeks later the harvesting of the ripened seed gives hope for the dream about the possible results. The first week in February is usually the time to start sprouting the new generation of seedlings – weather permitting! Two weeks later the majority of the sprouted seeds will have been transferred into small pots. 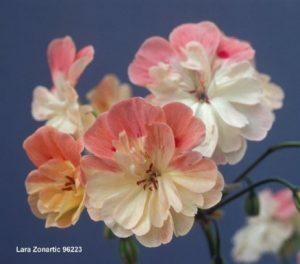 There is not a long waiting period to observe any form change or petiole length reduction – as there are indications of these changes during the first 2 to 4 months of growth. 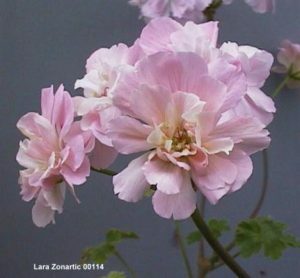 After about 9 or 10 months from sprouting it is flowering time, this is certainly the most exciting period in the yearly breeding cycle – the culminating moment of the year’s hopes and the wonderful feeling when sometimes seeing a new and beautiful flower opening up. It is always more exciting if being seen for the first time. Each new creation follows with opportunities for attempting other creative combinations. 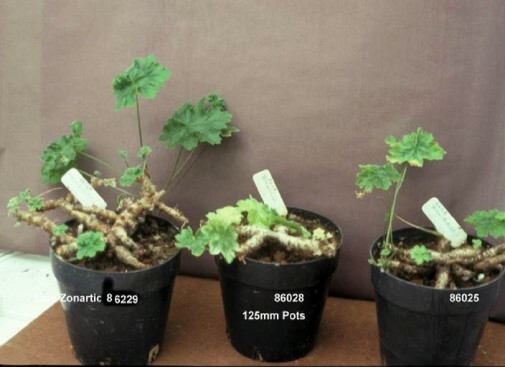 Having a plant of P. articulatum #1571A from Stellenbosch in 1984 – this was kindly given by Dr. Piet Vorster. The natural forces that are part of the creative environment are a necessary element in life’s many processes. 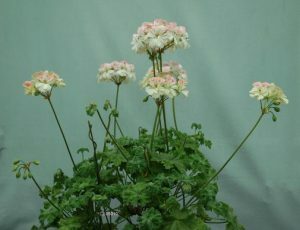 The ability of articulatum to combine with zonal type pelargonium cultivars when using controlled cross-pollination techniques. 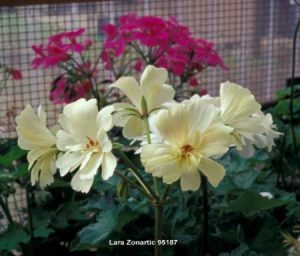 Having hybrid progeny that are fully fertile and which are compatible with self-pollinations and new combinations with seedlings and parent plants of this new family. Making sure all of the lineage and photographic details are recorded. Having perseverance, time and luck with an overwhelming interest in the whole procedure. Last but not least, a tolerant and encouraging wife. Enjoy more Zonartic in this article!